In order to maximise your time and accelerate your learning, ALL training is carried out on a 1:1 basis and you will be working with our Principal Trainer, Martin Powell. You will be supplied with all the DVSA-recommended study books (6 in total), plus a hazard perception DVD and, most importantly, the superb Part One Home Study Guide. The guide will give you a very logical and structured approach to assist with your learning. The real power behind the home study guide is that it will explain which chapters of which books to read at any particular point. This has proved to be extremely successful as you don’t need to read every single word of every book. It will then offer you the relevant ‘test’ so you can assess what you have learnt. There are thirty tests in total and the Part One Study Guide will ‘extract’ ALL the information you require, not just to pass the exam first time but more importantly give you the sound knowledge required for the rest of the course. The information learnt during this phase of your training will be INVALUABLE and assist you to progress smoothly through the rest of the course. There will be two x three-hour practical sessions interspersed with your home study; this will give your trainer the chance to keep in contact with you and to monitor your progress, but more importantly this will bring the theory material to life. The test itself is not difficult once you understand what is required. You will begin the course with an assessment of your driving and then hazard perception training on the computer (three hours). Don’t worry we don’t expect your driving to be perfect and we have seen it all before. Your driving techniques will most likely need tweaking as the vast majority of trainees will have taken no refresher or advanced driving courses since passing their driving tests. During the initial assessment, you will be issued with a fully comprehensive report that will document any of your driving that fall below the very high standard required. This will prove to be invaluable at an early stage as you will be able to practice in your own vehicle in between the sessions with your trainer. You will also receive two practical sessions at this early stage (three hours in total) on the principles of teaching and learning to give you an insight in to the techniques of talk through, watching the pupil, describing hazards, fault finding, lesson planning and giving briefings. This will give you a very good overview of what being a driving instructor actually consists of. Many training providers either shy away from or don’t attach any importance to this procedure but a brief insight to the above subjects will bring the immense amount of information that you are currently learning to life and give you a much better understanding of the subject matter going forward. This is just one of the additional benefits that make your training course one of the most comprehensive and successful available in the industry. Having a fully integrated training package at part one level is more likely to prepare you properly for the part one test, but more significantly give you a head start for the more demanding tasks of parts two and three. During this time many training providers leave you to get on with part one study on your own, with little or no contact with your trainer. Many training establishments will also tell you that all you need to do is revise practice questions and you will be fine. Follow this advice at your peril, as you could become part of the 57% that fail this relatively simple test. Even if you succeed at this level with gaps in your knowledge you will undoubtedly struggle with the more demanding tasks that lie ahead. Now that you have been practicing the points raised on your initial driving assessment you should be well on your way to driving the DVSA way. You will have 12 more hours of practical in-car training to assess and continually improve your driving standard. You will be supplied with the Part Two Driving Workbook which gives excellent advice on what the examiner will be looking for during the part two exam and also record sheets in order that you can keep track of your private practice in between sessions with your trainer. Many training providers will give you the impression that the test of driving ability is a glorified learner test. I can assure you that this is not the case and your drive will need to be of a very high standard (first time pass rate for the part two exam during 2013 was 48%). The training vehicle will be available for your use during the exam and, if you wish, your trainer will accompany you on the day to ensure that all runs smoothly and to clear up any last minute concerns that you may have. 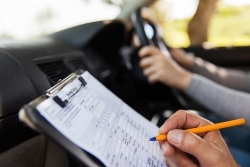 Very few training companies make the training vehicle available for the exam and if you have to use your own vehicle, it’s crucial to inform your insurance company as cover for driving tests is not included and additional cover will need to be purchased. Not all insurance companies will agree to this cover and you would then need to hire a vehicle to conduct the test. It is essential that you do not cut corners with your preparation for part two test. If you have reached this stage without the proper preparation you are going to be in for a sharp shock as this is where we start to utilise what has been learnt so far. You will now be able to recall the practice of parts one and two to accelerate your learning during this final stage. As with learning to drive, infinitely the best way of gathering and developing instructor skills is by taking regular one-to-one sessions at a time and pace that you feel comfortable with. This allows for short, intensive bursts of activity followed by periods of reflection in order to absorb the training and to carry out private practice. The part three course consists of 45 hours of tuition in a very structured manner. You will receive a Part Three Instructing Workbook with invaluable information to guide you to success. In the workbook you will record your progress to continually recap on strengths and weaknesses. You will also receive a visual aid folder to help with presenting lesson plans. There is no substitute for quality training and there are far too many people parting with over £3000 and then not receiving the thorough preparation that they deserve. The problem for the majority of those starting on an ADI career is that they will not know the difference between good and poor quality training, particularly at part three level. Add to this the fact that some major training providers have a relaxed view on their high dropout rate during part three training (if you drop out you will probably lose your money) and it’s another reason why pass rates are low. Embarking on any new career requires careful thought and research. You will undoubtedly have many questions and quite rightly so. You are most welcome to call the office on 0115 9894558 to discuss any points you wish to raise. I would be delighted to meet with you and it would be a major advantage for you to come visit the driving school office here in Nottingham where you can meet Claire, 1 Way Driving School´s Office Manager. We can then show you exactly how you would fit in to the team once you have qualified. You will be able to see the driving school in operation, how we take bookings for our instructors, how we tailor your own individual diary and the whole working practice that has made us one of the most successful driving schools in Nottingham.